Marta Urbina cuts the ribbon to our new school! On June 16th, 2014 a dream came true when the ribbon was cut at Casa de los Sueńos (The House where Dreams are Made), and the gates of a brand new schoolhouse opened to a brighter future for the amazing children of Education Plus! A simple ceremony, yet a major step forward in the ability to serve the needs of the students and their families. These beautiful children now have a permanent place to call their own to grow, learn, and mature into productive, responsible, and educated citizens who will someday be able to leave behind the vast poverty in which they now live. 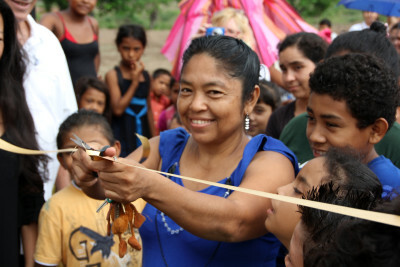 Marta Urbina, the local woman who has allowed the program to operate from her home for the last year and a half, had the honor of cutting the ribbon. Education Plus now has the capacity to teach and feed up to 200 students per day in a clean, quiet, safe, and local center just for them! The new facility features two classrooms, two bathrooms with flush toilets, a storage room, a modern and sanitary kitchen, a playground, and a covered eating area. Education Plus is now teaching not only English, but Spanish literacy and mathematics as well. Students rush to enter the new school for the first time! Although it was a rainy day, the weather could not dampen the spirits of over 300 people who filled the grounds. Parents, family members, community partners, and invited guests were given tours of the facility along with a brief meeting outlining the program’s new schedule and services. Everyone was treated to a delicious lunch and the children laughed and played on the brand new playground equipment. 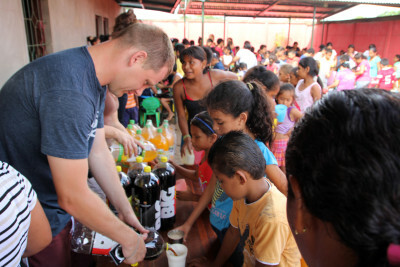 It is hard to believe that in only a year and a half Education Plus Nicaragua has transformed and grown from a dirt floor classroom in the hot sun with 2 classes and about 30 students into a beautiful, brand new building and grounds with 9 classes a day serving nearly 200 children! All of this certainly could not have been accomplished without the support of donors, community partners, volunteers, and friends. Education Plus’s challenge now is to create and maintain sustainability. With continued support, there is no doubt that the future is bright for Education Plus and our very special children and their community. 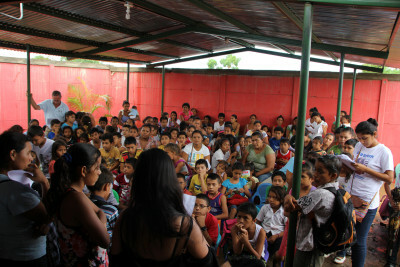 Education Plus feeds the children daily and teaches English and academics, social skills, values, and provides recreation, but the program’s leaders believe that the most important factor in the children’s success is that everything that is provided for them is applied with unconditional love and absolute respect. The students pass this along to each other and their families on a daily basis. The reward to those involved with Education Plus is in observing this loving and respectful behavior along with seeing the students’ positive educational and social growth. 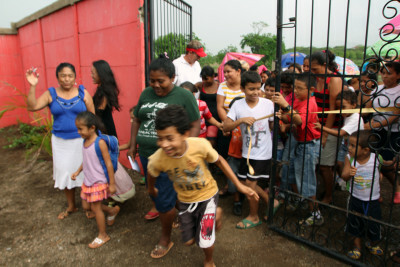 Thanks to everyone involved for making this new beginning happen and for loving the children of Education Plus Nicaragua! We look forward to more great news and progress to come! The rain did not dampen spirits!